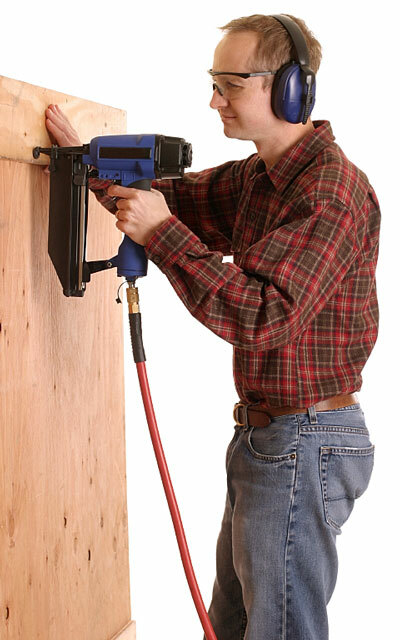 A carpenter uses a pneumatic nail gun to put nails into plywood. The worker wears protective earmuffs and plastic eye protection while using electric tools, to ensure his own safety during the construction process and also to conform to OSHA rules. A nail gun worker will benefit from the added precision and speed offered by an air-powered nailer. One of the issues and challenges that every nail gun worker faces is holding a stud in position as it is being nailed. Many carpenters find it difficult to keep the stud still while they are nailing. A framing nailer alleviates this problem; as soon as the trigger is depressed, it shoots the nail into the wood before the stud has a chance to move. Air-powered framing nailers are also ideal in situations that require lots of nails to drive, such as when putting on a roof or laying floors. When it comes to finish carpentry, nail gun users seek tools that help them get the job done as quickly and neatly as possible. Air-powered finish nailers allow finish carpenters to quickly and accurately apply nails to projects entailing trim, molding, window and door casings, and chair railings. When it comes to choosing finish nailers, carpenters have many choices to make, such as what gauge nail the tool is capable of shooting, how the fasteners load into the magazine, and whether the magazine is straight or angled. While air-powered nailers can certainly make the life of a carpenter much easier, they are dangerous tools that require safety precautions. It's important for the nail gun worker to follow all manufacturer's suggestions as well as general safety precautions, such as putting on goggles before picking up the nail gun.